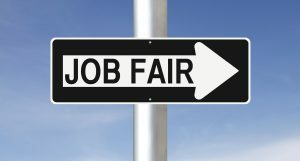 The 4th Annual Central Arizona College Job Fair will take place on Tues., February 12, at the Maricopa Campus (17945 N. Regent Drive, Maricopa, AZ 85138) from 10 a.m. until 1 p.m. There is still time for exhibitors to register for the expo. The general exhibitor fee is $30, while the fee for government and nonprofit organizations providing 501 3 (c) proof is $20. Each exhibitor will be provided with a table, a chair and a lunch for one representative. Space is limited for this event and will be assigned on a first-come, first-served basis. The last day to register as an exhibitor is April 6 at noon. For more information or to receive an exhibitor registration form, please contact Mitchell by phone at 520-494-5428 or by e-mail at ann.mitchell@centralaz.edu.